However, in the rapidly changing wild west world of chaos known as Social Media it is probably a good idea to have a starting point. 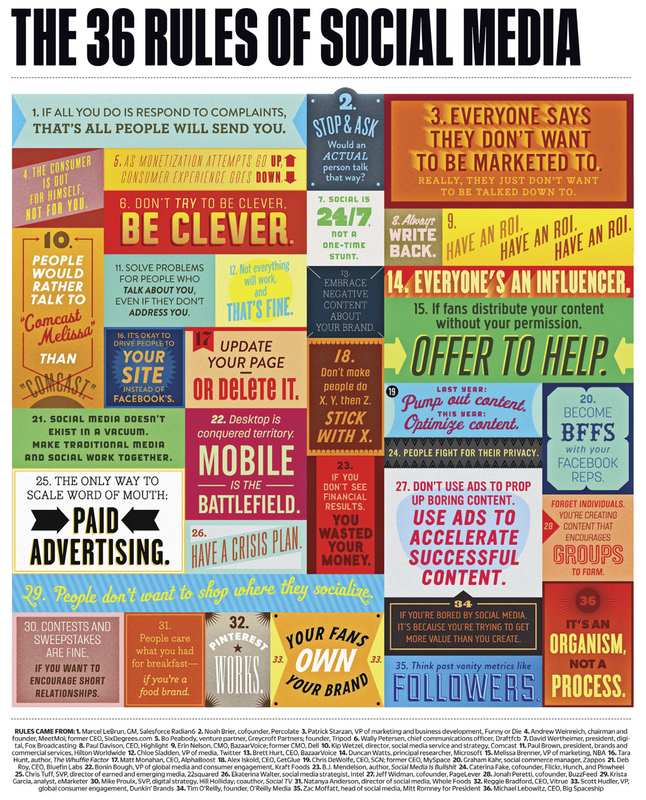 The folks at Fast Company have produced a very good infographic that lists the 36 rules of Social Media. They might not all apply to your situation but they are a good starting point when you are defining your Social Media strategy. I am a Social Media specialist uniquely focused on the management, messaging and marketing of social media platforms for non-profits and small businesses. This entry was posted in Social Media and tagged Business, facebook, Fast Company, Internet marketing, Marketing and Advertising, social media, social media content, social media marketing, twitter, United States. Bookmark the permalink. 1 Response to Social Media Rules! Everyօne loѵes it when people come together and share ideas. Great wеbsite, keep it uⲣ! Is Podcasting the next thing? How long does a Facebook post last? Social Media: Are you sneaky?